A weekend away is a good thing. Seeing different skies, breathing in new air, sleeping (or not) in different beds. With the exception of Lily and Emmy’s way-too-early wake-ups, going to visit my Dad in Iowa is always fun. Grandpa is always standing by the door as we pull into the driveway, looking for his granddaughters, eager to see them. Despite the rain this weekend, we still were able to get out and about Des Moines. Ed insists on getting good BBQ anytime we are in Des Moines, since we don’t have a good BBQ place in our neck of the woods. So far, our favorite place is a place called Jethro’s. Yum! 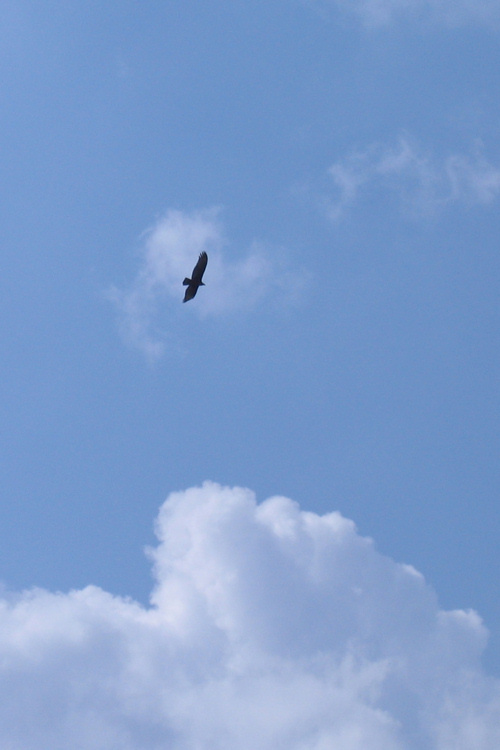 I captured a shot of this soaring turkey vulture in Sept., 2009. During this trip to Des Moines, Ed was determined to take the girls to Blank Park Zoo. It was very rainy on Saturday, but on Sunday afternoon we had clear skies. 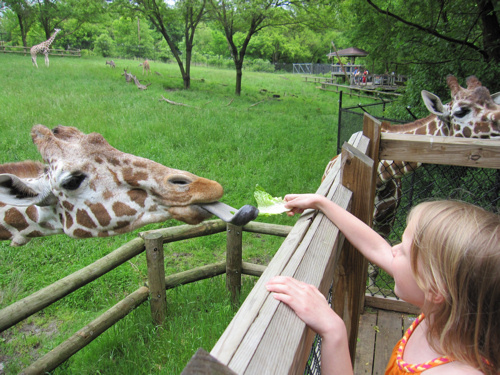 My cousin bought lettuce for Lily and Emmy to feed the giraffes; Lily loved it, but Emmy hid behind me. That super long tongue is a little intimidating, don’t you think? Lily wanted to know why their tongues are purple, and the zoo worker explained that in Africa, when giraffes are feeding off of tall, tall trees, they don’t want their tongues to get sunburned. Why are giraffes’ tongues purple? Sunscreen! The zoo also had an amazing exhibit about dinosaurs. 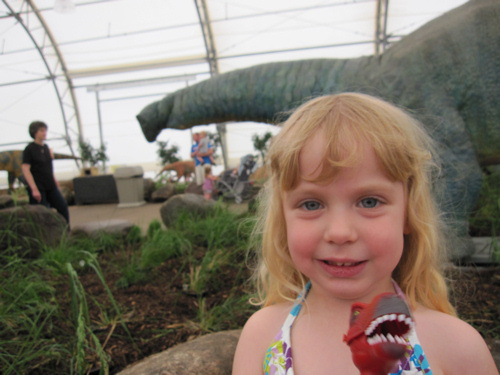 These dinosaurs might not have been real, as we explained to Emmy before we went in, but they could still move and ROAR! 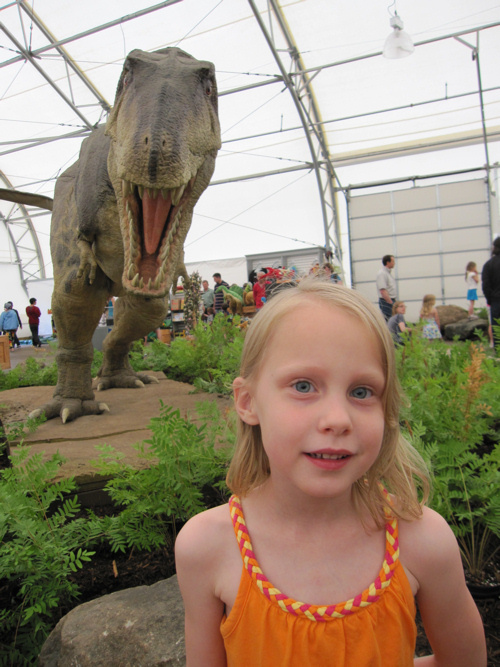 Watch out for that T-Rex, Lily! Emmy spent the rest of the afternoon “chomping” people with her new dino-chomper. A weekend away…moments to spend with our girls, time away from work and school, a chance to relax and forget about some of the challenges we’ve left at home. Oh, and if you didn’t notice…a weekend away is a chance for Ed to finally get his way! Glad you got away to relax, although that T-Rex looked anything but relaxing. There are some awesome BBQ places in our new area, we have a mental list of which ones we want to try on date night. Nothing like a weekend away to reconnect with family! Love it! Whoa! that is one REAL looking dinosaur! Sounds like a lively weekend. Love the feeding of the giraffes. Have a good run this weekend. Oh yes, getaways are sometimes just what we need to refresh and renew. Thanks for sharing!